UNESCO's Chief of the History and Memory for Dialogue discusses the organization's priorities in Africa and his personal relationship with the continent. If you want to know about African history from an African perspective, you talk to Ali Moussa Iye: Chief of UNESCO’s History and Memory for Dialogue section. UNESCO is a key partner in the African Film Heritage Project (AFHP) and, as a long time advocate of UNESCO’s efforts in Africa, Iye is the perfect person to shed more light on this partnership to restore and promote “lost” African films. Iye and UNESCO are no stranger to ambitious initiatives related to African history and heritage. Two examples come to mind. The first is the Slave Route Project, an attempt to address the history of the slave trade in a blunt and honest manner. The second is the General and Regional Histories Project, a larger initiative which includes the UNESCO General History of Africa, which aims to create a history of Africa as told and researched from an African perspective. UNESCO’s involvement with the AFHP hopes to build upon this track record. Iye talked with Cinema Escapist about his personal history with African film, the importance of cinema to keeping African history alive and flourishing, and UNESCO’s role in making sure the AFHP thrives in its mission to educate audiences the world over. Above all else, Iye reminds us that the AFHP is about bringing African cinema back to African audiences in order to change the future of film on the continent. As a Djiboutian, what has your experience been of cinema within the African continent? It’s hard to find out much about the cinema of Djibouti. Did you watch many African films growing up? Like many Africans of my generation, I discovered African cinema very late, long after my encounter with Hollywood and Bollywood films, which captivated me. My father, who was very religious, strongly forbade me to familiarize with what he called the “Devil’s Magic”, and I had to find all kind of pretexts to go clandestinely to the cinema. I grew up in a small town in Ethiopia and, at that time, going to the cinema was an adventure, as well as a risky journey. Despite all those odds, cinema and comics became a source of inspiration for me. I used them to fabricate silly stories to impress my friends during the storytelling game at dusk in the backyard. For a long time throughout my childhood, I actually thought that cinema was real. When I discovered it was created images, I was shocked. I still remember how my friends laughed at me for such naiveté. Still from 1983’s epic The Somali Dervish, one of the films screened by Iye (Courtesy of the African Film Database). Djiboutian cinema is still in its early developmental phases, if I may say. The first film was produced in the seventies during colonial times, and since then, less than ten films, mostly video films, have been produced by Djiboutians. Djibouti has very impressive landscapes, which have fascinated poets and writers. Maybe that is why some great films were shot there, such as the Planet of the Apes. When I discovered African cinema, I had already begun to understand the power of images as a means of expression and emancipation. With a group of friends, I created an Association for the promotion of African cinema and, in 1986, we organized the first African Film Festival in Djibouti. We screened films such as Djibril Diop Membety’s Touki Bouki, and La Noire De… (Black Girl) by Ousmane Sembene, among others. We also organized the preview of a Somali film about a historical figure, Sayid Abdallah Hassan, a great poet and freedom fighter. In the early 20th century, he challenged three colonial powers: the British, the Italians, and the French, who were occupying Somali territories in the Horn of Africa. We showed this film in order to raise awareness that cinema can address the Djiboutian people’s own history and concerns. From your personal experience, what do you believe are the issues that have seriously held back the development of African cinema, and what progress do you see being made within the continent and diaspora? In my personal view, the development of African cinema has met, and continues to meet, many obstacles. [For a start], the heavy investment needed to create the necessary infrastructure—before being an art, cinema is firstly an industry. Next, is the failure of African states to implement efficient and sustained policies to support their national cinemas, as well as an insufficient number of trained professionals in these crucial occupations, especially actors and producers. Moreover, freedom of expression was limited in many countries where one-party ideology was previously imposed. We had also neo-colonialist strategies to discourage the emergence of an independent and vocal African cinema. Finally, African filmmakers have failed to create a unified force that could ultimately influence national and Pan African policies, and confront foreign interferences. However, the cinema landscape is changing in Africa today. The new generation of African filmmakers are taking advantage of the potential that new technologies offer, in terms of production and distribution. They are experimenting with new ways of using images to tell African stories. After decades of producing films tailored specifically for festivals, or created to meet the expectations of funding institutions from the North, the third generation of filmmakers is trying to put African cinema on a new path, which will be of more relevance to the concerns of the diverse, African public. I think African cinema and cinematography is full of promise. The entire continent nourishes a variety of extraordinary people and talents as-yet-untapped, [as well as] historical figures [with stories which] deserve to be shared with the world through films. Why do you think there has been a lack of serious, unified international support for the preservation, restoration and exhibition of African cinema until now? The lack of coherent policies from African governments has not facilitated the development of African film industries, nor does it provide appropriate structures to promote and preserve this heritage. This situation has favored the interventions of various external players pursuing their own agendas. Since the introduction of video clubs, movie theaters have drastically disappeared in most African cities. Because of all these shortcomings, African cinema, paradoxically, is better known outside Africa than in its own continent. The challenge today is to bring African films back to the African public. That is why it is important to restore and preserve emblematic films that have previously been overlooked. Courtesy of Keti Koti Rotterdam. As a partner in this initiative, how involved is UNESCO in the African Film Heritage Project? Is this an initiative being driven by The Film Foundation and FEPACI, or is your organization actively involved beyond support and promotion of the project? I think there has been good timing, as well as a convergence of interests and efforts between UNESCO, the African Film Heritage Project, and FEPACI. In 2015, we created an international coalition of artists to promote the messages of the General History of Africa (GHA). This was a monumental collection of eight volumes, which mobilized the greatest African scholars and thinkers. Their aim was to rewrite the history of Africa from an African perspective, deconstruct the usual racial prejudices, and provide scientific evidence for the significant contributions that African peoples have contributed to the general progress of humanity. Within this initiative, cinema appeared to be an important art, and we naturally identified filmmakers as crucial partners in carrying the GHA messages. The Film Foundation, under the leadership of Martin Scorsese, contacted us in order to establish a partnership around this project. We recommended that they also associate the FEPACI, which is the Pan African organization that has been defending the same cause for decades. The International Organization of Francophonie is another partner whose experience in supporting the production and promotion of African films is well-recognized. A few years ago, they contacted UNESCO to propose a collaboration around an interesting initiative: the creation of a Pan African Fund to support the production of films focusing on African history. If this collaboration is successful, it would be complementary of our partnership with the AFHP. What specifically will UNESCO do to provide African audiences more access to the resources that will become available as the AFHP progresses? There are certain African countries that have less developed cinematic cultures and infrastructure than the likes of Nigeria or Burkina Faso—how will they benefit from the AFHP? The AFHP’s work concretely responds to an urgent need, and it reinforces UNESCO’s action to sensitize African member states to the necessity of preserving their film heritage. We also have a program called Memory of the World, which offers the opportunity for member states to inscribe some of their audiovisual heritage as world heritage. The program recognizes documentary heritage of international, regional, and national significance. In addition, it creates documented archives, and subsequently assigns an identification logo. It facilitates preservation, as well as access without discrimination. Moreover, it campaigns to raise awareness of documentary heritage by alerting governments, the general public, businesses, and commerce for the need of adequate funding and preservation initiatives. The Memory of the World program complements other UNESCO programs, such as the World Heritage Sites List. UNESCO has also adopted a Recommendation on the Safeguarding and Preservation of Moving Images, which encourages the organized deposit of the world’s film heritage in official archives. It is possible that some of the films restored by AFHP will become part of this Memory of the World Register if the concerned stakeholders take the necessary steps. Through our GHA project, we will also promote the AFHP’s achievements and publicize the restored films, in particular those films addressing historical events. We will use them to raise awareness on the ownership about their history. I hope that the partnership agreement, signed with the Film Foundation and FEPACI, would also allow us to explore other areas of collaboration. With the appointment of a new UNESCO Director-General with a background in film, as well as the establishment of the AFHP, do you think cinema is now going to become a priority for the International Coalition of Artists for the General History of Africa, and UNESCO in general? Cinema is definitely one of the most efficient arts and tools that we have identified to promote the GHA. That is why we invited several African filmmakers to join our International Coalition of Artists for the GHA. For example, we are planning to organize an event in Paris, which will be known as “African Filmmakers and the History of Africa”. We will discuss how the knowledge gained through the GHA has inspired their artistic creations, and how they could better exploit it in the future. We are indeed very happy that our new Director-General (Audrey Azoulay) has also a longstanding experience in the promotion of cinema acquired within CNC, the famous French institution that succeeded in supporting the production and promotion of French cinema across the world. We are counting on her support and advice to strengthen our collaboration with Martin Scorsese’s initiative with the AFHP. Africa is one of UNESCO’s top priorities for the next years, as well as gender equality. How exactly is supporting African culture, rather than education or science & technology, going to help achieve the goals set out in these two priorities? The reason why UNESCO’s member states have chosen Africa and gender as the two global priorities for the organization is obvious. There are two areas where more efforts are yet to be made to address inequalities and discrimination, and provide equal opportunities in education, culture, sciences, and communication. In that respect, cinema appears as an area where these two priorities can be combined. In fact, more and more African women are using this art as a means of transformation, to express their perspectives on various cultural and social-political issues and advocate for women empowerment. In Africa, the gender gap is successfully being challenged in cinema, which is more than in other domains of activities. You’re heavily involved in UNESCO’s “General History of Africa” project—for you, what is cinema’s place within the last few centuries of African history? Has it always been a crucial part of the continent’s heritage during this period, or is it only just becoming an important part in understanding Africa’s more recent history? Cinema is a relatively recent art in Africa, except in Egypt. It is not yet sufficiently considered as an African heritage that needs to be restored and preserved. In Africa, efforts are generally focused on the preservation of oral traditions and written archives. UNESCO has provided a lot to support African governments in that area. However, over the last decades, the preservation of African films is becoming a matter of urgency, as many great films are beginning to deteriorate, and we risk losing them forever. For us, these films themselves have become a part of the African history, as they offered particular interpretations of the evolution of African societies. I consider African filmmakers as the modern griots (folk storytellers) of African history, the recent history of the last century. Therein lies the importance and urgency of restoring, preserving, and promoting classic African. They contribute to the plurality of worldviews, as well as the diversity of cinematographic approaches and styles. The world itself needs to know about the visual expressions coming from the continent, which is considered to be the cradle of humanity, and the origin of its initial cultures and civilizations. In that sense, Martin Scorsese’s initiative to contribute to the restoration, preservation, and promotion of African films is a very timely and very pertinent one. UNESCO could not but praise this initiative and form a liaison through the implementation of a formal partnership agreement. Are there any African films or filmmakers in particular that you hope will get the attention they deserve as the African Film Heritage Project gets underway? Perhaps from Djibouti? The selection of films that deserve to be restored and preserved should be made in collaboration with African professionals. Within the GHA project, UNESCO can, of course, identify films addressing historical events. They can also make suggestions to choose the most relevant ones for restoration and preservation. This is, in fact, one of the objectives of the partnership signed with The Film Foundation. 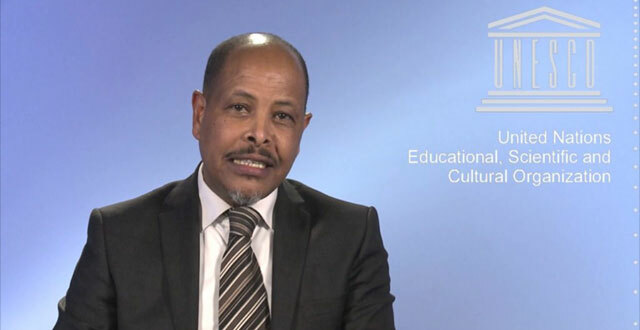 Ali Moussa Iye is Chief of the History and Memory for Dialogue Section of UNESCO. You can find out more about UNESCO’s work in Africa here. This is the second in a series dedicated to hearing from the various organizations involved in the African Film Heritage Project, each focusing on different elements involved with the AFHP. For our final part of this series, we will be talking to Aboubakar Sanogo from FEPACI, Margaret Bodde from The Film Foundation, and Cecilia Cenciarelli from Cineteca di Bologna. You can read our exclusive interview with Martin Scorsese here.